“Precisely and poetically, Keith Farnish cuts down to the core of every issue—the problem is civilization itself—and proceeds to equip underminers with the perspective and skills (via ample tasks as jumping off points) to not just dismantle the machine but, more importantly, to recreate real community and reclaim our humanity. A beautiful, paradigm-shifting work; I found each chapter to be more profound than the last.” – Stephie Jane Rexroth, Goodreads. Industrial Civilization is likely to be the last great empire humanity will ever see. If it is allowed to continue in its ravenous way then there is no future for humanity, for the natural systems and processes that allow humans to exist on Earth are the very things that Industrial Civilization is destroying. In fact, no form of civilization has ever been sustainable nor ever will be. In order for humanity to continue on Earth then civilization has to stop, and people allowed to return to a way of living that is connected to the real world. We are not able to do this. At least not until we become Underminers. The industrial system depends, for its survival, on humans being disconnected from the real world and mentally attached to the machine that we fuel with our civilized lives. The Tools of Disconnection keep us in that state, and the only way to prevent us from being responsible for our demise is to undermine those Tools of Disconnection. Once we are free from the grip of the machine and reconnected with the real world then the myth of Industrial Civilization will die, and humanity will be able to continue. Underminers is the timely follow-up to Time’s Up! An Uncivilized Solution to a Global Crisis. It takes up where that book left off, with a detailed, highly practical approach to the process of undermining in all its many hues. At once entertaining, shocking and inspiring, Underminers draws on the author’s own experience dealing at first hand with the lies of the industrial machine, and that of a wide range of other people who have their own unique take on the swath of topics covered in the book. From the reasons we are unable to act, to the nitty-gritty of keeping ourselves and others safe during the undermining process, the first half of the book is an invaluable guide to navigating the industrial system and becoming a fully-formed Underminer. The second half details, with surprising openness how the reader can utilize their abilities and new-found determination to be an effective Underminer; whether that be undermining the advertising industry or the political machine, turning symbolic protestors into real activists, building self-determined communities or simply being ourselves – connected, free human beings. We are the Underminers, and this is our time. Author’s Note: The presence of a link to, an essay by, or an extract from the work of, a person does not represent an endorsement of their entire body of work, or their activities outside of writing / activism. The book was written in 2012 / 13 and since then, personal activities have eclipsed the writings of some individuals. It is possible, some of the language used in this book may be slightly outdated – I will endeavour to correct this whenever I become aware of it. PRIMARY: ARCHIVE.ORG – CLICK/TAP TO DOWNLOAD PDF (opens in new window). The published, paper version is now OUT OF PRINT, but you can still order copies directly from the author by using the Paypal link below (sorry, I know it’s Paypal, but I want to make life easier for buyers). Select the “Donate” button then login to Paypal and type in the amount you need to pay. Important note: You will need to ensure your country’s import laws allow for books. If your country adds import tax, then please add this to the payment. You can also order the eBook via a number of retailers if you would like to pay for it, alternatively just use the archive.org link above for all sorts of pre-formatted, and free, options. 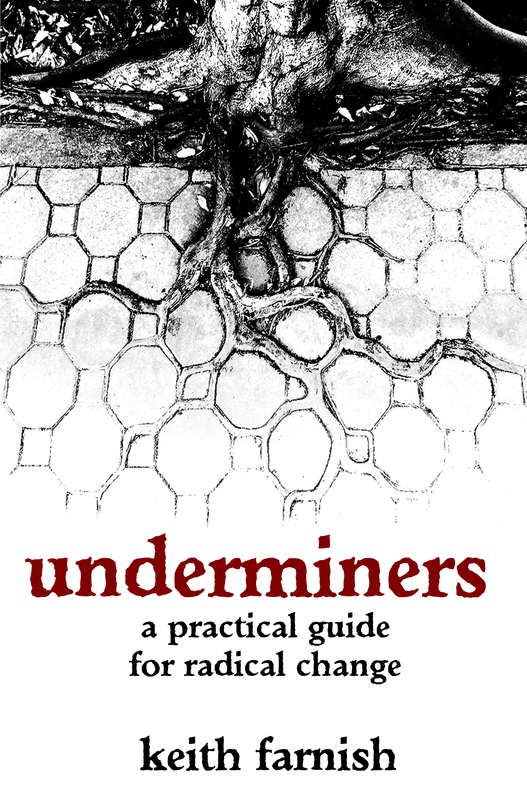 Underminers: A Practical Guide for Radical Change by Keith Farnish is licensed under a Creative Commons Attribution-NonCommercial-ShareAlike 3.0 Unported License. This is also a blog about the book, the act of writing it and getting it into the wider consciousness. The two parts of this website can be found at the top, by going to either The Blog or The Book. Within The Book you will find a description of the book with links to the individual chapters that you can read on screen. There is also a drop-down menu linking to each chapter. Underminers is published, online, under a Creative Commons license, so you can distribute it and republish it so long as you credit the author and do not use it for commercial purposes.